The new Casio EX-FH100 is a new high-speed, high-zoom digital compact camera, marrying a 10x ultra-wide lens with a 10 megapixel back-illuminated CMOS sensor and the ability to shoot at an amazing 40 frames per second. In addition, the EX FH100 can record high-speed movies at 1,000fps, 420fps, 240fps, 120fps, 30-240fps or 30-120fps, has a Prerecord Continuous Shutter setting that starts shooting when the shutter button is depressed halfway, and offers high-speed Night Scene, Lighting, Anti-shake and Portrait scene modes which combine several burst images into a single, clear photo. The FH100 can also shoot 720p HD movies complete with a built-in HDMI port and stereo microphone, offers Aperture/Shutter-priority and Manual shooting modes, and even supports the DNG RAW format. 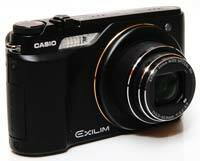 Available in black, the Casio EX-FH100 officially retails for £279 / $349. 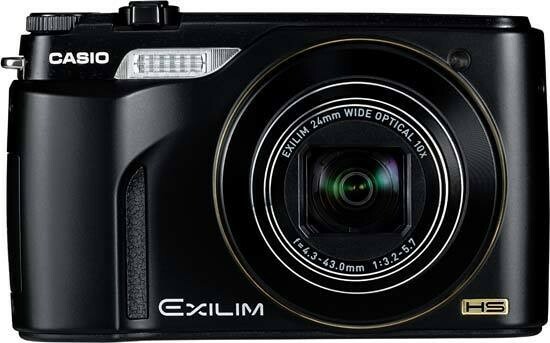 As with most Casio cameras that we've reviewed in the past, the EX-FH100 is an extremely well-made compact digital camera, with a stylishly sober matt-black metal body and excellent overall finish. It's just small enough to fit into the palm of your hand, despite featuring a versatile 10x optical zoom lens that's equivalent to a focal length of 24-240mm. The maximum aperture is a respectable f/3.2 at the wide end, but a slower f/5.7 at the other extreme of the zoom range. The EX-FH100 is quite slim, measuring 29mms thick when turned off, making it ideally suited to either a trouser pocket or small camera bag, and it weighs 183g without the battery or memory card fitted. The EX-FH100 is one of the better models on the market in terms of build quality. Even the tripod mount is metal instead of plastic and is positioned centrally in-line with the lens. There's a small but useful handgrip on the front, coated in a textured plastic, making the camera easy to get to grips with. 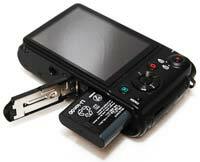 Changing cards or batteries is not possible while the FH100 is mounted on a tripod, because the compartment door hinge is too close to the tripod socket, but this is usually the case with most compacts. Otherwise this is about as good as it gets for build quality in the world of compact cameras. The Casio EX-FH100 has relatively few external controls, just 13 in total, despite the fact that this is quite a complex camera in functionality terms, with a lot of photographic control on offer. All the controls are clearly labeled using industry-standard symbols and terminology, with just a couple of Casio-specific buttons that require a quick read of the manual. Located on top of the EX-FH100 are the lozenge-shaped On / Off button, the left and right stereo sound microphones, and a tactile Zoom Lever encircling the rather small Shutter button. The HS Button located on top of the camera above the LCD screen toggles between Single Shot and the Continuous Shooting mode. In Single Shot mode, the Casio EX-FH100 records just 1 frame per second (at 10 megapixels), but in Continuous Shutter mode it can take up to 40 shots per second, although only at 9 megapixel resolution and only for 30 frames. The number of shots per second can be set at 40, 30, 15, 10, 7, 5, 3, 1 or auto, and you can set the total number of shots in one burst at 30, 20, 10 or 5. The Prerecord CS option saves up to 30 frames prior to the moment that the shutter button is actually pressed, helping you to avoid missing the action. Once the images have been taken, they are saved in either a Batch containing all of them, or played back at slow speed so you can select the ones that you want to keep by pressing the shutter button. There's a traditional Shooting Mode Dial on top of the Casio EX-FH100, which has a positive action that doesn't get knocked out of place easily and provides quick access to the Best Shot, Auto, Aperture-Priority, Shutter-Priority and Manual modes. Accessed via the Best shot option on the shooting mode dial, the Casio EX-FH100 offers a comprehensive range of 27 different scene modes aimed at the user who just wants to point and shoot, making this camera particularly well-suited to the beginner. There are four Best Shot scene modes that are particularly worthy of mention - High-Speed Anti-Shake, High-Speed Night Scene, High-Speed Night Scene with Portrait, and High Speed Lighting. These modes take full advantage of the Casio EX-FH100's continuous shooting speed to improve image quality in traditionally difficult shooting conditions. The camera combines a number of images taken in burst mode and aligns the position of the subject to form a single, sharp shot. Although these modes can't perform miracles, they do produce notably sharper shots when hand-holding the EX-FH100 in low-light conditions. In addition the High Speed Best Selection mode automatically selects the best image from a set of images taken in burst mode, choosing the sharpest image, and if there is a person present, the image with the subject smiling and not blinking. Other notable Best Shot modes include Move Out CS and Move In CS, which use the Casio EX-FC100's pre-record functionality to capture a subject as it moves into or out of an adjustable frame on the LCD screen. Multi-motion Image mode automatically selects the same moving subject within a series of multiple images and combines them into a single image, effectively creating a multi-exposure shots that visually tracks the subject's movement. In addition to the Auto and Best Shot modes, the Aperture-Priority, Shutter-Priority and Manual will prove particularly appealing to more experienced photographers looking for more control over what the camera is doing. Somewhat disappointingly there are just two f-stops available in aperture-priority, wide-open f/3.2 and stopped-down f/7.5 (depending upon the zoom setting), although the Shutter-Priority provides a full range of speeds from 30 to 1/2000 second. The Manual mode lets you set both the shutter speed and the aperture, although again there's only the same two aperture settings to choose from. The aperture is set by pressing the Set button and using the Quick Menu options on the LCD screen. On the rear of the EX-FH100 is a large 3 inch LCD screen, with a number of controls to the right, including a traditional round navigation pad. You can directly access the various flash options by clicking down on the navigation pad, whilst up is used to toggle between the various Display modes (no information, shooting info, shooting info with histogram). The Set button in the middle performs two main tasks - it selects menu options, and also accesses the EX-FH100's Control Panel. This is a vertical list of options displayed on the right of the LCD screen, which provides quick access to some of the camera's more important options, including image size, ISO speed, white balance, and exposure compensation. This system is a good compromise given the size of the camera's LCD screen and therefore the limited space for external controls. It takes a little while to get used to the presence of this on-screen list, but you can toggle it off using the Display mode if it proves too distracting. Above and below the navigation pad are the self-explanatory red Camera and and green Playback buttons, which switch between the two modes. Above the camera button is the very welcome inclusion of a dedicated Movie button, which makes it quick and easy to shoot a movie without missing the start of the action. Encircling the Movie button is the Movie Mode switch, which can be set to either High Definition / Standard or High Speed Movies. Starting with the former mode, the EX-FH100 can record standard quality movies at 640x480 pixels at 30fps in the AVI format, or High Definition quality movies at 1280x720 pixels at 30fps. You can even pre-record up to 5 seconds of footage using the Prerecord Movie Best Shot mode. There are some limitations to the EX-FH100's HD movies though. The AVI format choice results in some massive file sizes that quickly fill up your memory cards, and the length of a movie is bizarrely limited to only 10 minutes. Even worse, you can't use the optical zoom at all during movie recording (although there is a digital zoom setting available). On a more positive note, you can use the various Best Shot modes to help enhance your movies, the Anti-Shake system works for both still images and movies, and the stereo sound system is a big improvement on the usual mono option. The High Speed Movie mode allows you to record a movie at up to an incredible 1000fps, effectively slowing down the subject movement. Six different frame rates are available - 1000 fps (224x64), 420fps (224x168), 240fps (448x336), 120fps (640x480), 30-240fps (448x336) and 30-120fps (640x480). This extreme slow-motion effect is initially very appealing and sure to impress your friends, but as with the HD movie mode, there are some drawbacks to be aware of. You can't use the optical zoom, sound isn't recorded at all, horizontal bands can appear as the lighting fluctuates, and the actual sizes of the recorded movies are pretty small, especially the 224x64 pixel, 1000fps mode. The Menu button is positioned below the navigation pad. 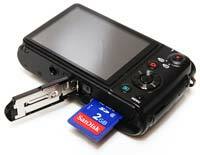 The menu system on the Casio EX-FH100 is perfectly straight-forward to use. Quite a lot of the camera's main settings, such as white balance, exposure compensation and ISO speed, are accessed elsewhere, so the main menu system isn't actually that complicated. A row of 3 icons along the top of the LCD screen represent the Record, Quality and Set Up sub-menus, with most of the options being the kind that you set once and then forget about. Due to the very large and bright LCD screen, the various options are easy to access and use, especially as only 6 are shown onscreen at one time. The Casio EX-FH100 features an anti-shake system. Turn it on in the menu system and the EX-FH100 automatically compensates for camera shake, which is a slight blurring of the image that typically occurs at slow shutter speeds. There are three different modes. Camera AS uses the camera's mechanical CMOS-shift system to minimize hand movement, Image AS increases the ISO speed to minimize subject movement, and Auto uses both systems to compensate for both hand and subject movement. In practice I found that it does make a noticeable difference, as shown in the examples on the Image Quality page. You don't notice that the camera is actually doing anything different when anti-shake is turned on, just that you can use slower shutter speeds than normal and still take sharp photos. Leaving the anti-shake system on all the time didn't affect the battery-life too much, with the camera managing just over 275 shots before the rechargeable Lithium-ion battery ran out of power. There is a single port on the right side of the Casio EX-FH100 (when viewed from the back) which accepts both the USB interface cable required to connect the camera to a printer or computer, and the AV cable. There is also a mini-HDMI port for easy connection to a HD TV set, although as with most other manufacturers Casio don't supply a suitable cable in the box. There are no controls on the left side of the EX-FH100. On the bottom are the tripod mount and lithium-ion battery compartment, which also houses the SD / SDHC memory card slot, and the speaker. Overall the camera body feels very well-designed and not at all cluttered, despite the presence of the large 3 inch LCD, which has a wide viewing angle from left to right, average resolution of 230,000 dots, and is perfectly visible in most conditions. There is no optical viewfinder on this model. If you have never used a digital camera before, or you're upgrading from a more basic model, reading the comprehensive and fairly easy-to-follow manual before you start is a good idea. Unfortunately Casio have chosen to cut costs and only supply the full manual as a PDF on a CD, rather than in printed format. Not much use if you're taking pictures and need to find out what a particular option does. The start-up time from turning the Casio EX-FH100 on to being ready to take a photo is not particularly quick at around 3 seconds, and it takes about the same amount of time to zoom from the widest focal length to the longest. Focusing is very quick in good light and the camera happily achieves focus indoors or in low-light situations, helped by a powerful green focus-assist lamp. It takes about 0.5 second to store an image, allowing you to keep shooting as they are being recorded onto the memory card - there is a very quick LCD blackout between each image. In Continuous mode the camera takes just 1.0 frame per second at the highest image quality, which is slow for this class of camera, although the shooting rate is at least maintained until your memory card is full. Things get much more interesting if you don't mind recording your images at 9 megapixels - then you can shoot up to an incredible 40 frames per second, as detailed above. The EX-FH100 can record both JEPG and RAW files, but it takes so long to save a single RAW file - astonishingly over 15 seconds - that you need the patience of a saint to persevere with it, as you can't use the camera until the RAW file has been saved to memory. Once you have captured a photo, the Casio EX-FH100 has a good range of options when it comes to playing, reviewing and managing your images. You can instantly scroll through the images that you have taken, view up to 25 thumbnails onscreen at once, and zoom in and out up to 8x magnification. You can view slideshows with different effects and interval settings, edit movies and print a specific frame, adjust the white balance and brightness, and set the print order and the transfer order. You can also protect, rotate, resize, trim, and copy an image. If you've recorded a continuous burst of images, you can divide them up and edit a specific image. The Display button toggles detailed settings information about each picture on and off, such as the ISO rating and white balance, and there is a small histogram available during playback which is helpful in evaluating the exposure. A third press of the Display button shows just the image with no information displayed.